Dogs may become infected with Giardia by drinking out of streams, lakes, or ponds containing Giardia cysts. If your dog has been diagnosed with Giardia, the dog is infected with the one-celled protozoan parasite Giardia lamblia. These flagellate parasites are usually contracted by drinking contaminated water or sometimes by eating contaminated feces. Giardiasis, the disease caused by Giardia, can range from asymptomatic (no visible signs of distress) to extremely acute where the dog is severely ill. Canine giardiasis should be treated because it is potentially transmissible to humans and other animals. Giardiasis is a malabsorptive syndrome. The parasites adhere to the lining of the small intestine, where they interfere with absorption of nutrients. Light cases of Giardia often go undetected, and many dogs “self-cure” by expelling and developing an immunity to the parasite. In heavier infections, Giardia can interfere with absorption of certain types of nutrients, especially fats and certain vitamins. Fats are not absorbed and result in excess mucus in the stools that are pungent and diarrhetic. The parasites interfere with normal metabolism by forming a physical barrier between the lumen of the intestine and the absorptive cells. Excess mucus results from malabsorption of fats, while excess water results in the diarrhea. The intestinal lining is not usually injured, so stools should not contain blood. The parasites feed on partially digested food in the lumen of the intestine. They do not compete directly with the host for food. Their metabolism is primarily anaerobic, meaning that they do not use oxygen in their respiration. They lack cellular organelles concerned with aerobic respiration such as mitochondria. The active stage within the host is the trophozoite (feeding body); this is the only pathological form. The transfer stage of the parasite is termed the cyst. Giardia forms cysts by extruding cellular food particles and other vacuoles and secreting a resistant cyst membrane around the cell. This highly resistant cyst is then passed from the host in the feces. Trophozoites may be passed but quickly die. Cysts that are passed into water can survive for an extended time, up to 1–2 months under proper conditions. Survival times on land are somewhat less. A new host becomes infected by drinking fecally contaminated water or eating the feces of an infected animal. While food-borne transmission is rare, it has been documented for humans. 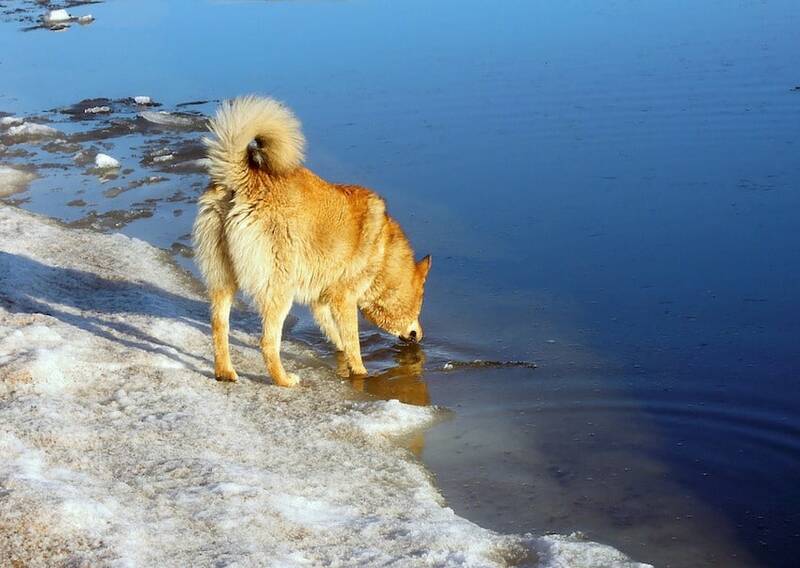 Dogs may become infected by drinking out of streams, lakes, or ponds containing Giardia cysts. Other sources of infection are wild animals that visit the kennel area and deposit infected feces in an area accessible to the dog. Scats of other dogs or wild animals are potential sources of infection for domestic dogs. Giardia is potentially transmissible to humans, so caution is warranted. Giardia can be difficult to detect even for professionals. It is too small to be seen by the unaided eye. A high-quality microscope is needed for proper diagnosis; phase contrast microscopy is helpful. A definitive negative diagnosis should include stools collected on multiple days because cyst production tends to be cyclic, with millions produced one day and few the following day. The cyst is the diagnostic stage of Giardia. Cysts tend to be 9–15 micrometers in length and 4–5 um in width. Cysts are identified by size, the presence of 4 nuclei, axostyles, and claw-hammer-shaped median bodies. See your veterinarian for the best treatment regimen. Recovery is usually uneventful, but a dog may become reinfected after treatment. Thus, it is important to try to isolate and eliminate the source of infection. Dr. James Coggins contributed to this article. ©1992–2019 K9 Web. All Rights Reserved. K9 Web contains opinions and is not intended to diagnose, treat, or give medical guidance. Consult your veterinarian.